Volume 4 in the series 'The RIAS Amadeus Quartet Recordings' presents the ensemble with 20th century Hungarian and English works. The Baroque composer Henry Purcell is also represented � as a reference point for Benjamin Britten�s Second String Quartet. This edition substantially broadens the view of the Amadeus Quartet and demonstrates the inquisitiveness and assuredness with which Norbert Brainin and his three colleagues explored the music of their contemporaries. Prompts to follow this path came from fellow musicians and colleagues at London�s Morley College. Under the direction of Michael Tippett, a group of young composers, including M�ty�s Seiber and Peter Racine Fricker, wrote their new string quartets for the Amadeus Quartet. Apart from Michael Tippett, it was first and foremost Benjamin Britten who, around 1950, established his reputation as Britain�s most renowned composer. His Second String Quartet was conceived as a reminiscence of Henry Purcell, a progenitor of English music, for the 250th anniversary of his death. Two of Purcell�s string fantasias and a chaconne, on which Britten had based his work, have therefore been included in this edition. They are released for the first time in the Amadeus Quartet�s interpretation. The Hungarian composer M�ty�s Seiber � who, like the members of the Amadeus Quartet, had to emigrate to Britain after the Nazis had seized power in Germany � wrote his Quartetto lirico in the spirit of the Viennese School, particularly that of Alban Berg. He also championed the string quartets of his fellow countryman B�la Bart�k, whose Fourth and Sixth Quartets are also available for the first time as performances by the Amadeus Quartet. 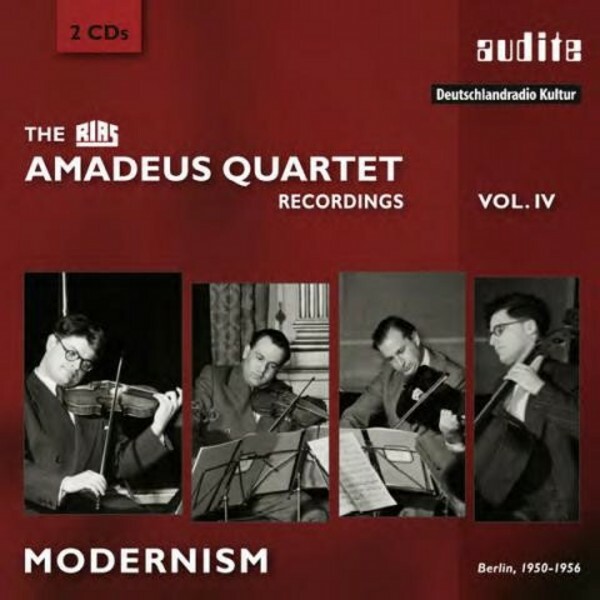 The audite series 'The RIAS Amadeus Quartet Recordings', scheduled to include six volumes, exclusively presents performances released for the first time on CD.